I'm excited to be bringing you yet another fall-inspired look from Ann Taylor. This outfit pulls together two of my favourite trends we're seeing for fall this season: camel tones and leopard stripes. I thought the tuxedo-striped detailing on the pant was a great statement which kicked them up a notch. I've paired the the leopard-print tee with some fun gold chains and am particularly loving the gold plated chain from Simply Lush. This site offers fun and bubbly baubles that pack a punch to any outfit. Definitely worth a browse! The leopard print is amazing! Such a great combination - these pants look exactly like the Chinos I was just going to buy from J. Crew...will have to check them out! Love it! Buying that top right now! I am usually not a leopard girl but I have fallen in love this year! It seems to be that I like the deeper hued prints...with the dark tan and black combo. Love it! 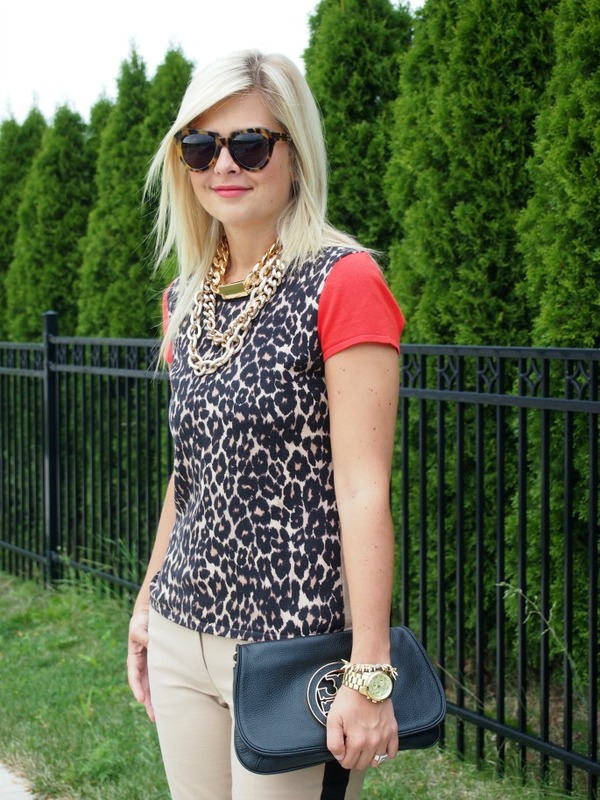 Those pops of red are great in this look! These pants are so great! I love the tuxedo stripe detail. I've been debating for quite a while over whether I should get striped pants just like that! Seeing them on makes me consider them even more seriously now :P And I adore the way you layered those necklaces (or are they just one necklace?)! So cute. That top was made for you. This is a fabulous look! I love the tuxedo style pant. I'm also in love with anything leopard. The red in the sleeves and shoes give an incredible pop of color to the neutral colours. Love it! I think I need that top in my life - great outfit! That top is amazing! That red is a great colour on you! Hope your week is going great! Love those tuxedo pants... at the Loft outlet they were on sale for $20 but unfortunately they didn't look as good on me as they do on you!